On a cool monsoon evening, I sat on a bench made of rock and cement, crusted thinly by moss on a layer of black mass. This bench has been here for not more than a year, and this is its first season in the rain. Beside this bench is a dense mass of grasses, sedges, and herbs like Common Balsam (Impatiens balsamina) and Pot Cassia (Cassia tora), growing taller than the surrounding. I sat gazing at this small island as thin raindrops settled upon the blades and the spikes of grass. Like sitting on a safari vehicle, looking out into the grass for signs of a crouching tiger, I looked on. A grass frond sprang up from a corner of the island, the drops settled upon it now flying through the air. Like a tiger shuffling after arising from a cool pond. A grasshopper sat munching upon the blade of grass, right where the blade could take its weight. Munching; engrossed. Like a tiger, I reminded myself, like a tiger. A snail slowly made its way on the stem of the spikelet, just as another started descending from another. The raindrops increased in size. And another grass frond sprang up. The grasshopper sat munching, lolling on its now-thinning blade of grass; the snail reached the spikelet of grass as the other reached the base of the stem. The rain increased, and I looked for cover under the Mahua (Madhuca latifolia) tree across the island; its thick broad leaves a waterproof crown. From there I noticed the island of grass was once a bench like the one I sat upon. The evening wore on quickly. I decided to write a short note to remember this little moment, an allegory to the moments cherished, or yearned for, by most visitors, once I reached the station. The rain persisted; filling all the dents in the ground with crystal clear waters. A pair of Black Drongo chased after Jungle Owlets as they went in search of a dry bough to roost in. On dark mornings and evenings when thin rain allows for a walk, birds, mammals, and reptiles, are all in hiding. 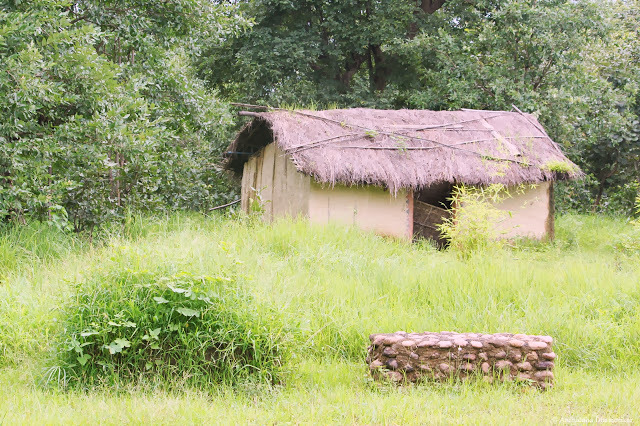 The parks are closed, and a general consensus lingers amongst many tourists that wildlife and monsoon do not gel well. But monsoon is probably the only season of sheer adventure of all. 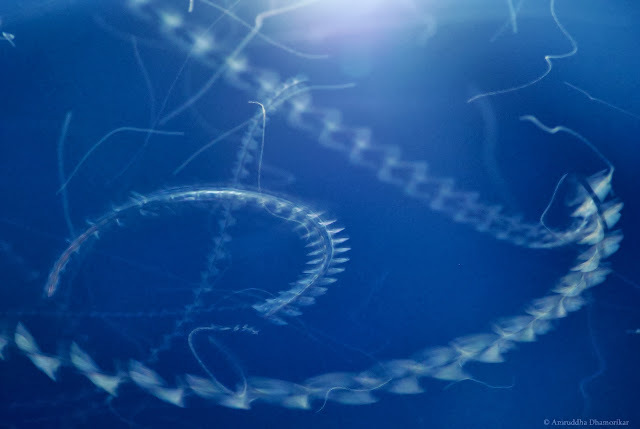 And one of the most unique to see the other life. Look at your feet, near you, and you will see the other life, the life that encompasses over 75% of all life: insects, spiders, and myriad forms of arthropods. They’re on leaves, on ground, in tiny burrows, hanging in the air, wading on water or submerged under it; chewing, biting, piercing, licking. In a world under your feet lay a world quite visible but believed invisible. I sit every morning and evening observing these as and when time permits. A troupe of ants, six strong, strode over the wet path one day, dodging rain and tiny pools. If they sensed something fishy, or interesting, with their tiny elbowed antennae, one ant would take the lead to investigate, and invisibly signal others to come. They all would stand around the object of interest, and, if disinterested, move on in a bunch after an antenna-to-antenna discussion. I cannot help but allegorize these Camponotus ants with dwarves in search of lost treasure. Under the Mahua hangs a light bulb reigned by a mighty horde of Weaver Ants (Oecophylla smargdina), their numbers, I reckoned, in multiples of thousand; like a thousand-strong pack of Dhole (Cuon alpinus). Every night over a leaf under the shine of the light the ants struggle to tear tiny insects in pieces, not to consume selfishly, but to take them back to the nest and feed their larvae. On the platform surrounding the tree, a myriad of beetles, ants, moths, and bugs roam and fly around haphazardly – their motion signifying absolute randomness in the sea of an incandescent light. Most of the beetles, moths, and bugs come here to seek the warmth of the light. The ants, however, have different intentions. Be it the penumbra or umbra of the light, the ants are heaving, panting, struggling, pulling, and fighting, to get maximum of this bounty. Their nest is meters up the tree, in total darkness, created out of leaves green and brown sewn together by the larvae, their children. In the morning this same place is clear of any struggle. Only a few ants with raised antennae and open mandibles guard the trunk and leaves of the Mahua. Elsewhere, where paths or forest clearings are free of water, roam another kind of a predator named after the very tiger – the Tiger Beetles. They’re one of the ephemeras of Central India. 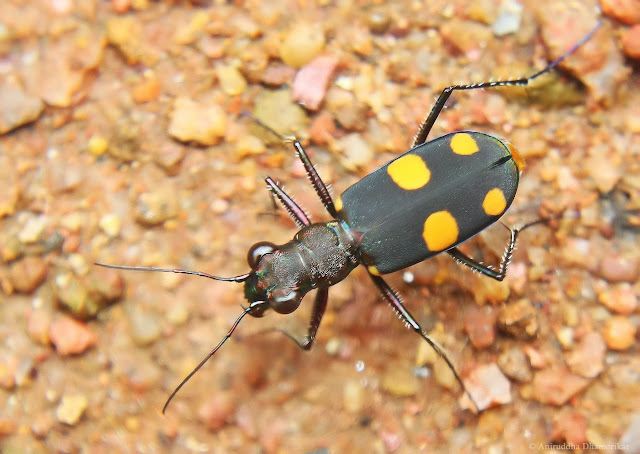 The common Tiger Beetles of Central India, to name a few, are C. bicolor haemorhoidalis, C. viridilabris, Calochora flavomaculata, and most probably Cicindela dasiodes and C. undulata, however no one really knows the real diversity of these beetles here, or the entire of peninsular India for that matter. They chase after ants as tigers chase after deer. They are said to be the fastest of all insects in the world, reaching such preposterous speeds that research says they temporarily go blind. Their adult life begins by June and comes to an end by August; as fast as their flight. On one August evening along a muddy bank of a paddy field I found little holes and heads popping in and out. 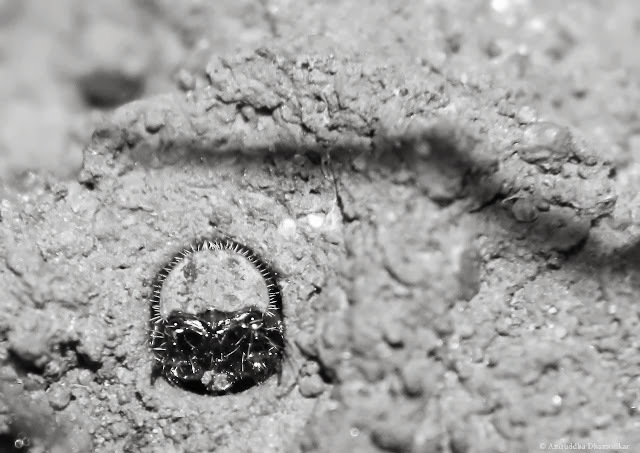 These shy little creatures were the grubs of the Tiger Beetles: infamous ant-killers. Any passing ant within the reach of their heavily built mouth is a sure kill. How they survive the rain, cold, and summer, until they can emerge out once again as adult tiger beetles to rule the undergrowth, is a story of bravery and struggle best left to our imagination. Walking in grasses sends a number of insects flying in all directions: moths, grasshoppers, beetles, are some of them. It is like walking in a forest, your troll feet flushing out all that you could eat, if you get the hyperbole. The grasses are their micro-habitat where they roost, feed, or breed. Some would only emerge under the cover of darkness, while others would remain here from birth to death – such as the grasshoppers. These niches are no safe haven either. In here lurk the master hunters of the other life – the Praying Mantises. 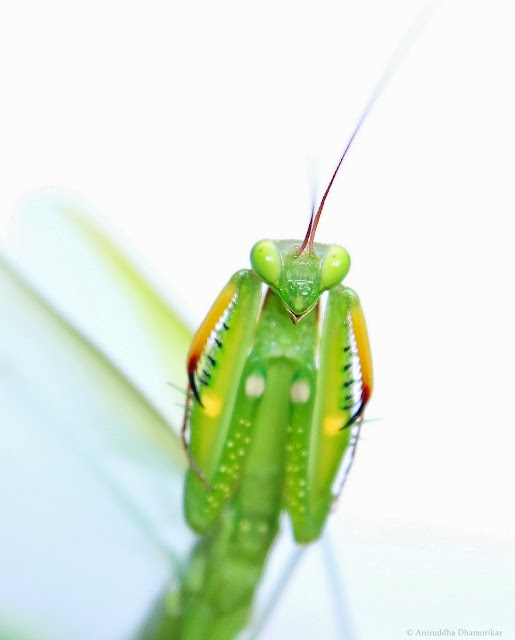 Mantis is the superb opportunist, capable of empowering anyone smaller or bigger its size. Trouble one, and you’ll be sure to get a good pinch from its saber-toothed raptorial legs. So brave is this hunter of the undergrowth that it would even try to scare you with its superb display of aggression. Imagine yourself on a stroll through the forests, and coming face-to-face with a mantis crossing the road by bobbing its body back-and-forth. It does this to match the wind playing in the leaves, and it believes that the dance is so cunning that you’ve probably not seen it, and so it doesn’t mind you walking in its direction, until the vibrations in your footsteps catches it by surprise, and it unfurls its wings, arches its thorax upwards, and spreads out its knife-sharp raptorial legs – and to your horror, hisses so well that you feel nothing but awe and surprise. This defensive mechanism works well to surprise an intruder, and the closer you go into the mantis’ comfort zone, the frightening it looks, if you were an insect. But the bluff called by mantis is only to scare off the intruder. There are others belonging to the undergrowth that show-off their brute strength with not much ado: the scorpion. The scorpions, especially the Giant Forest Scorpion, do not threaten or move about much when confronted with an intruder. 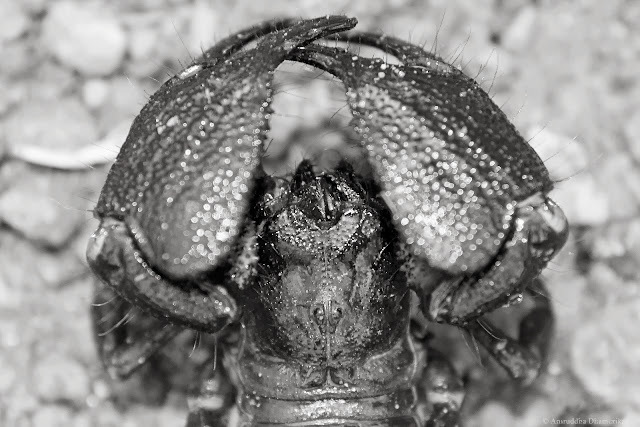 They lay quiet, cover their face with the enlarged pincers, and keep the stinger raised, in wait of striking at the moment the limit of patience is crossed. The scorpion does not bother itself with putting up aggressive display, for its reputation is well known. The dog that does not bark bites. The most common animal you will confront on your way through the forest is not Chital, nor Sambar, nor any bird, but an ant; lots of ants. Ants unfortunately have a bad reputation probably because they bite and sting, but more so because they do not have pretty names like the said deer species they share their habitat with. 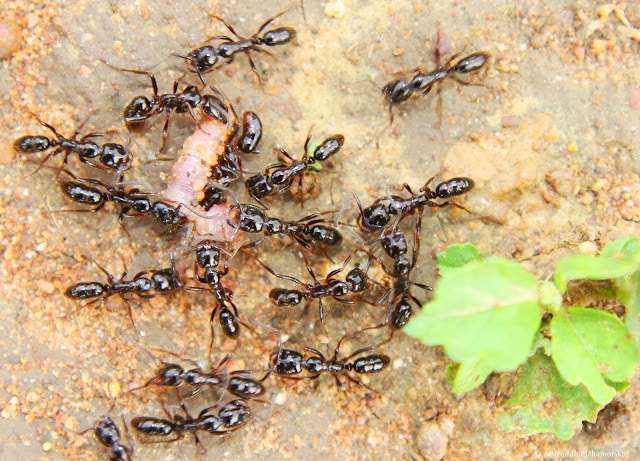 Ants common in the Central Indian forests, which peculiarly live on ground, are Myrmicaria brunnea, Leptogenys processionalis, and several species of Camponotus, and Pheidole. Remembering one ant name is akin to remembering titles to tigers of any nature reserve. But they’re here, most probably in numbers weighing more than that of tigers of that reserve. Most of these ants are scavengers, but also opportunists, with the ability to harvest seeds and leaves, herding aphids and treehoppers, as well as hunting. Walking in forests is not dangerous just because there lurk carnivores, but also because of ants. Camponotus ants depend upon their hard mandibles to tear flesh, while M. brunnea and L. processionalis are notorious for their sting that throbs and itches for a week after the first encounter. Not all animals gang up to either kill or sting, however. There are others that do so for protection, just like deer. In monsoons you are likely to come across a mass of blood-red strings piling on top of one another, travelling like a herd of Chital or Gaur. These little creatures are millipedes, probably hatchlings. These hordes eat and travel as a group. There is no one leader to lead them, but they walk by piling on top of one another such that the leaders of first lap (I call them the first wave) are overtaken by the second wave which walk over the top of the first wave, and the third over the second, and so on, until the first wave is the last to pile upon the last wave to come back to the lead. No average herbivore, of the world, is capable of such efficient movement system. When disturbed, they travel in group, but the slowest are left behind – but that is no matter for their aposematic colours warn the predators that they are likely poisonous. And last but not the least, the insect which even the tiger-throbs would not forget – the butterflies. They do not form the core of the insect diversity of Central India, but are an important species for their aesthetic values. 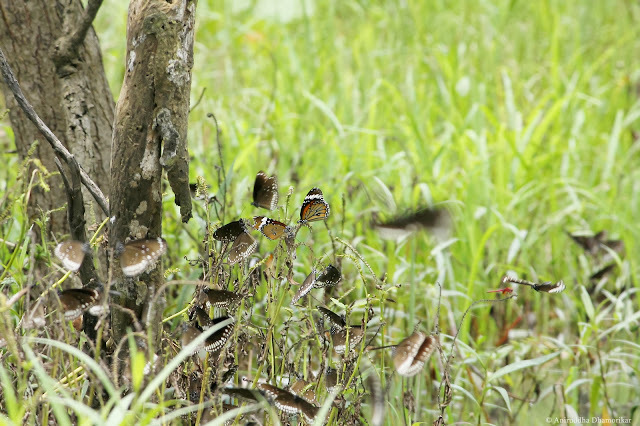 Who would not want to see a butterfly, or a rabble of them, fluttering about? The irony lies in what you like – the past-life or its incarnation. I’ve come to observe that people, for obvious reasons, would like to have butterflies visiting their gardens than their caterpillar which eat up plants to become butterflies. These animals, if I use the human hierarchical system, form a layer over that of plants, or that slimy layer of oil which allows free movement of the door of your car, or that rag-picker keeping your city streets clean. They perform the most basic function for which they are unrewarded. In an ecosystem, however, they form the very core of wildlife. Wildlife is not about marvelous animals and magnificent birds, but about life that is independent of any human interference. And today, of all the animals, it is insects, and a large number of arthropods, which are free from man’s dominion. If I went to one and asked its opinion about this era being dubbed the anthropocene, there sure could be a potential upheaval and a rebellion (and likely human extinction). We see the allegory of the more famous animals in the other life, which renders us visionless to appreciate them in their true form. If only people would pay a little more attention to the other life of the nature reserves, one would not have to resort to the rhetorical use of figures of speech to signify this larger diversity of life.